Summer may be coming to an end, but we still have many stunning bridal hair and make-up looks from our busy summer of weddings to share with you—starting with gorgeous Marci at Fiesta Americana! With Marci’s long, shiny dark hair, a hairstyle that showed off her hair length and still looked romantic and polished on top was the perfect choice. 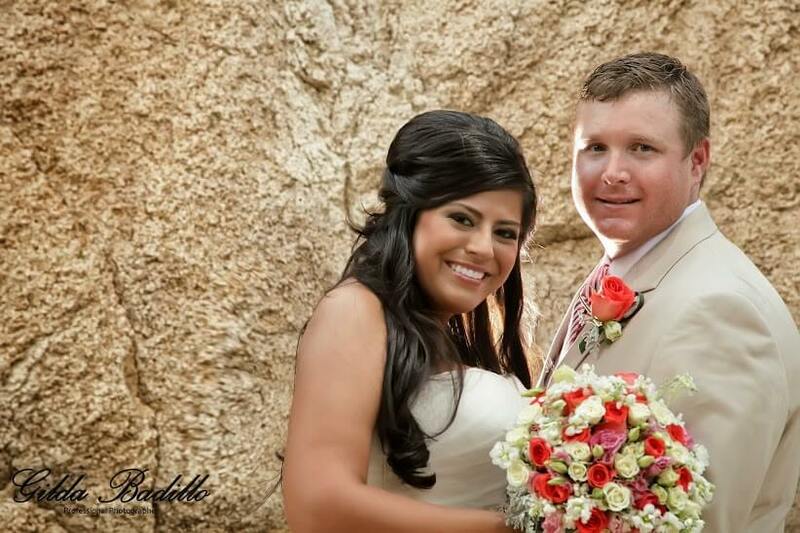 We gave her a half up- half down-do that was just lovely with her strapless bridal gown. For Marci’s bridal make-up look, we applied a berry lipstick and used shades of gold and brown on her eyes. These colors always go great with an olive skin tone like Marci’s, and they don’t look washed out in photography the way pastels and nudes can sometimes look on darker skin tones. 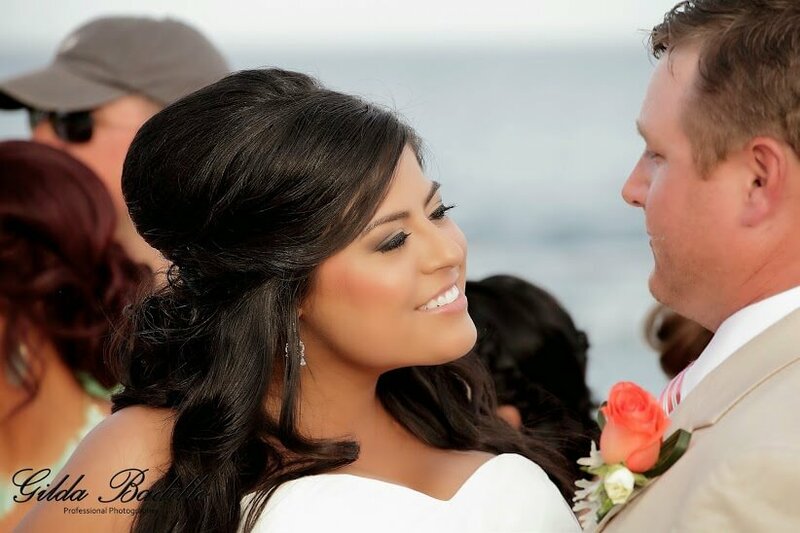 This bride had amazing natural lashes, so we didn’t need to apply any to complete her look. 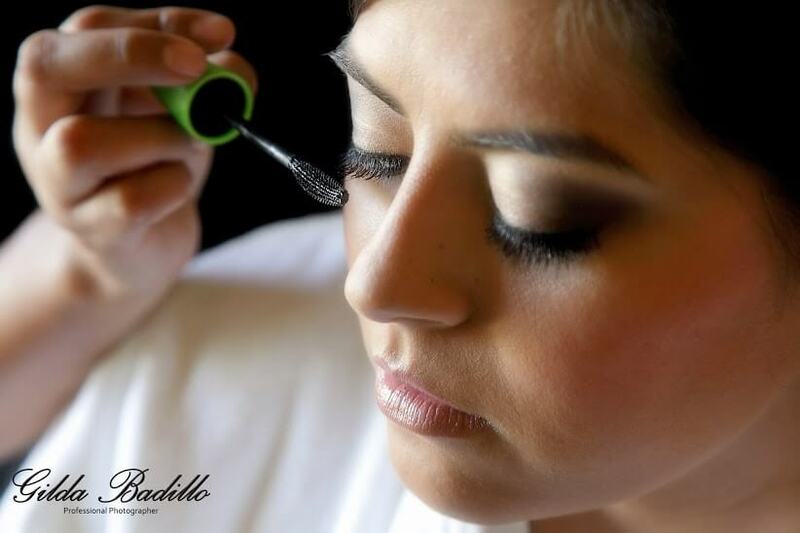 We do offer this extra service, however, for brides who want full one by one lash sets, strip lashes or just a few individual lashes in the corners of their eyes. Adding lashes is a fun way to make your eyes stand out even more on your wedding day! 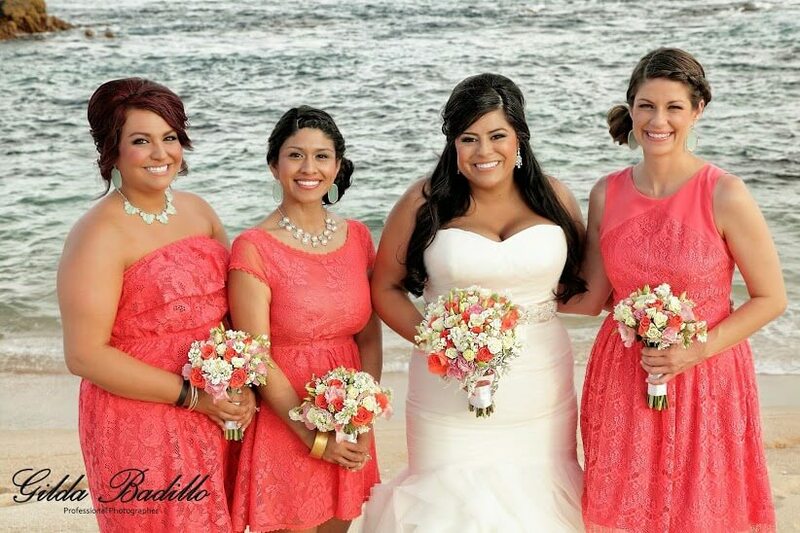 We are so thrilled at how Marci and her bridesmaids looked on her wedding day! Thank you Gilda Badillo for the wonderful photography! 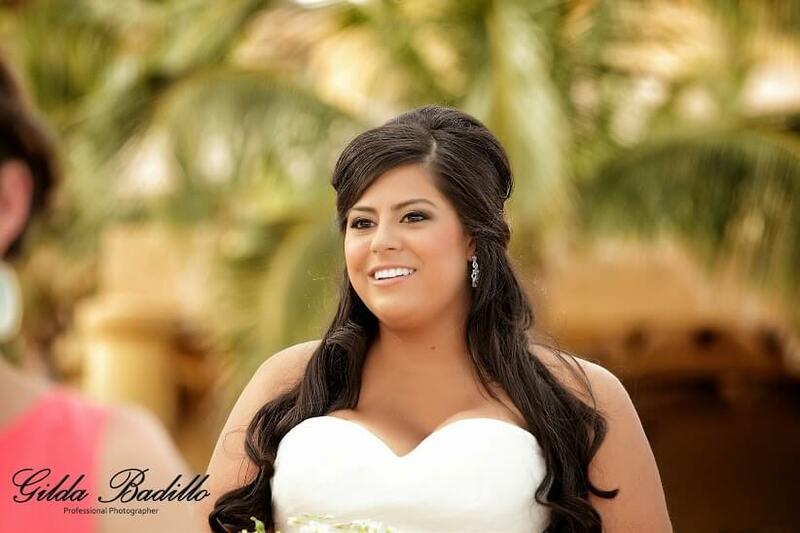 This entry was posted in Cabo Bridal Hair and Makeup and tagged beachy bridal hair, berry wedding lipstick, Cabo bridal hair and makeup, Cabo bridal salon, cabo salon, Cabo wedding hair and makeup, Cabo wedding hair salon, Cabo wedding makeup, destination wedding in Cabo, destination wedding in Mexico, Fiesta Americana wedding, gold wedding makeup, strapless wedding gown on the beach, Suzanne Morel review, wedding makeup for olive skin.